An estimated 1.4 million individuals have criminal records in Wisconsin, according to the Wisconsin Policy Forum report. Photo by Jabril Faraj. Maurice Buchanan, 41, said he served time in prison for his crimes but he’s not finished paying for them. He doesn’t have a job, he said, because employers eliminate him as a candidate or fire him because of his past criminal record. “I made a lot of poor choices growing up and I’ve had a hard time trying to overcome them and take care of my family,” Buchanan said. He said he most recently worked as a server at a restaurant in a downtown hotel, but after three weeks his employer let him go. “They did a background check and said I couldn’t work there anymore,” Buchanan said. Like most individuals who have been convicted of or charged with crimes in Wisconsin — whether they resulted in convictions or not — he can’t wipe the slate clean, according to a new report from the Wisconsin Policy Forum (WPF) that detailed the state’s much tougher-than-average expungement laws. Expungement is the process of having your record sealed by a judge and removed from Wisconsin Circuit Court Access Program (CCAP), a website employers often utilize to perform background checks on prospective hires. Expungements are approved based on the determination by the judge that an ex-offender will benefit from having their record sealed and that society will not be harmed, according to the report. 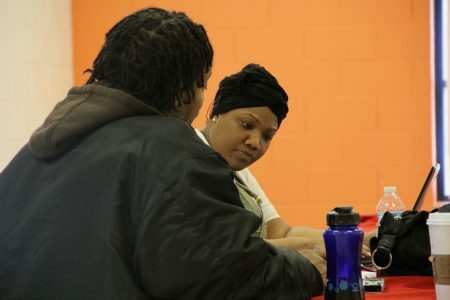 Shanyeill McCloud of Clean Slate Milwaukee checks a man’s criminal record, to see if he is eligible for expungement, during an event in 2016. Photo by Scottie Lee Meyers. The report, “Fresh Start,” was prompted by a separate analysis of public transportation that found that not having a driver’s license and having a criminal record were the biggest barriers for those struggling to get a job in Milwaukee, said Joe Peterangelo, report co-author and senior researcher for WPF, formerly known as the Public Policy Forum. “We have businesses looking for employees in Wisconsin and our population of working-age people is not growing while the number of retirees is. Changing the expungement law would allow people to clear up records or even charges they were not convicted of that are preventing them from getting jobs,” Peterangelo said. Besides limiting employment opportunities, the report states, having a criminal record also prevents ex-offenders from being able to obtain certain professional licenses, business loans and financial aid for higher education. It limits other opportunities as well, he added. The report highlights several factors that separate Wisconsin’s expungement laws from almost every other state in the nation, including that Wisconsin prohibits retroactive expungements for crimes that occurred before 2009. It allows them only for misdemeanors or nonviolent felonies such as property and low-level drug offenses. Wisconsin is also the only state that requires the expungement decision be made at the time of sentencing. Most states wait until the sentence is served and then let individuals apply. Wisconsin is one of only a handful of states that limit eligibility for expungement to those 24 years of age or younger. Nearly 63 percent of all criminal cases between 2006-2017 involved offenders age 25 and above, the report found. “Older people don’t have a chance in hell for expungement which is ridiculous because those are the moms and dads of the household,” said Shanyeill McCloud of Clean Slate Milwaukee, an organization that provides expungement services for eligible young adults who have misdemeanor or non-violent felony convictions. According to a separate Badger Institute study cited in the WPI report, only 2,000 expungements occur each year in Wisconsin. But, in Milwaukee County there were only 506 expungements between 2010 and 2016. Fewer expungements occur in Milwaukee County than Outagamie, LaCrosse and Kenosha Counties, despite there being three times as many eligible cases here, the report found. McCloud said she provides trainings for workforce development staff and other job trainers on how the expungement process works and how to recognize individuals who are eligible. McCloud said because the laws in Wisconsin limit the number of individuals she can provide expungement services for, she has also changed some of her focus to organizing those who are ineligible to share their stories in hopes that it will help convince lawmakers to make changes. A bill sponsored by Rep. Evan Goyke (D-Milwaukee) and Rep. David Steffen (D-Green Bay) that would have changed the state’s expungement law was introduced during the 2017-18 legislative session and passed both the Senate and Assembly. But, lawmakers could not agree on a final version, according to the WPF report. The bill would have switched the decisions on expungement until after the sentence was completed. The proposal also would have required the Department of Justice to redact records of expunged crimes when responding to public records requests and remove them from its online criminal history database. The DOJ maintains those records regardless of whether they have been removed from CCAP, noted the report. The legislators are planning to reintroduce the legislation, Assembly Bill 331. The change would not raise the minimum age required for expungement. “Our proposal is a critical step to ensuring that a pathway to employment for youthful offenders exists, which serves a direct benefit to both the youth, as well as employers throughout our state looking to fill vacancies,” wrote Goyke in a statement. Kori Ashley, a staff attorney for Legal Action of Wisconsin who helps youth and young adult offenders expunge their records, said the process for expungement differs for youth and adults. Juveniles, upon completion of their sentences, can petition to have their records expunged as long as they stay out of trouble, she said. For adults, the process is much more difficult, which is why the recommendations made in the report are so important, Ashley said. The report highlights several possible changes to the state’s expungement laws that could help remove employment and other barriers for thousands. It looks at the impact of permitting retroactive expungement, allowing non-convictions to be expunged, removing the age requirement and allowing expungement of more felonies. If the age requirement were lifted, it states, there could be 3,300 more cases eligible for expungement in 2019. The report also addresses the concerns raised by lawmakers and others that changing the expungement laws might overload the court system and increase costs. According to the study, those issues could be alleviated somewhat by allowing judges to make expungement decisions without hearings, based on whether they meet a specific set of criteria. Minimal changes to the expungement law outlined in the report would have a huge impact on Milwaukee, Ashley said. 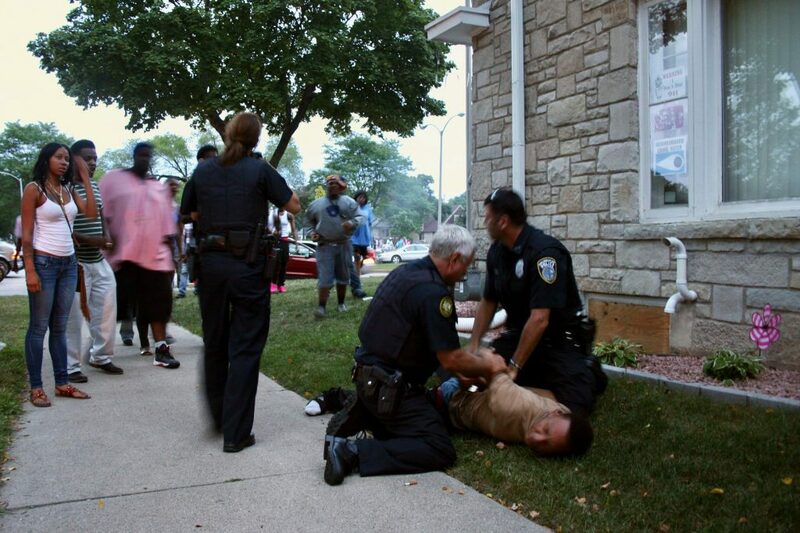 “You don’t get that second chance very often in Wisconsin, which creates a huge barrier. Instead of starting over with a clean slate, you’re forever tainted by your record,” she said.